The Blunting Express Kit can be used to generate blunt-ended DNA fragments for subsequent use in ligation, cloning, cDNA construction, and MCLAB’s Topomize Amplicon Library Prep Kit (Cat# TopoA-50A or TopoA-50B). Our proprietary enzyme mix effectively fills in 5’ overhangs and eliminates A-tailed 3’ overhangs on the template. The Blunting Express Kit can be used to generate blunt-ended DNA fragments for subsequent use in ligation, cloning, cDNA construction, and MCLABs Topomize Amplicon Library Prep Kit (Cat# TopoA-50A or TopoA-50B). Our proprietary enzyme mix effectively fills in 5 overhangs and eliminates A-tailed 3 overhangs on the template. This Blunting Express Kit is optimized to provide a rapid workflow with only 2 minutes of incubation. Efficiency is combined with a high performance to streamline your blunt-end objectives. Due to our proprietary Enzyme Mix, this kit provides a rapid workflow with a blunting step that requires only two minute incubation. Its high efficiency is combined with a high performance to streamline the blunt end cloning objectives. PCR fragment size checked before and after end blunting by the kit. 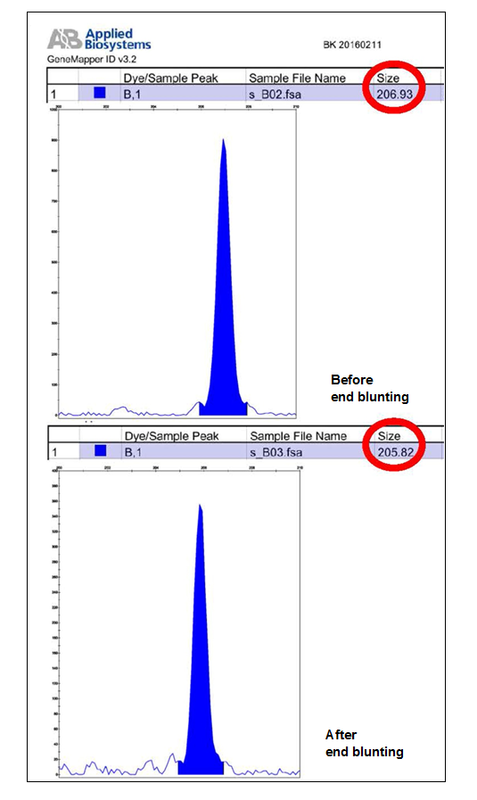 Data are generated by Applied Biosystems 3730/3730xl DNA Analyzer.